The holidays are over, and we're left with nothing to look forward to but a few more months of bitter cold weather. Oh, and snow! Lots of snow! So let's take photos of snow! Take a photo with snow as its subject—that can be a snowy scene, where everything is dusted, or a snowball flying straight at your camera lens. We just want to see the snow. Snow reflects light, making it very well lit under the sun. But your auto camera settings will usually appear to underexpose snow images. There are fixes for this. You can shoot manual, of course. Or you can tweak your exposure compensation dial up to +1 or +2. That basically tells your camera, "Hey, let a little more light into the photo. That's cool with me right now." Also, when you're photographing in very cold weather, you should take some precautions to protect your gear. More on that here. Our lead image, by Anthony Quintano. It's a great use of just a few colors isn't it? White snow. Blue sky. 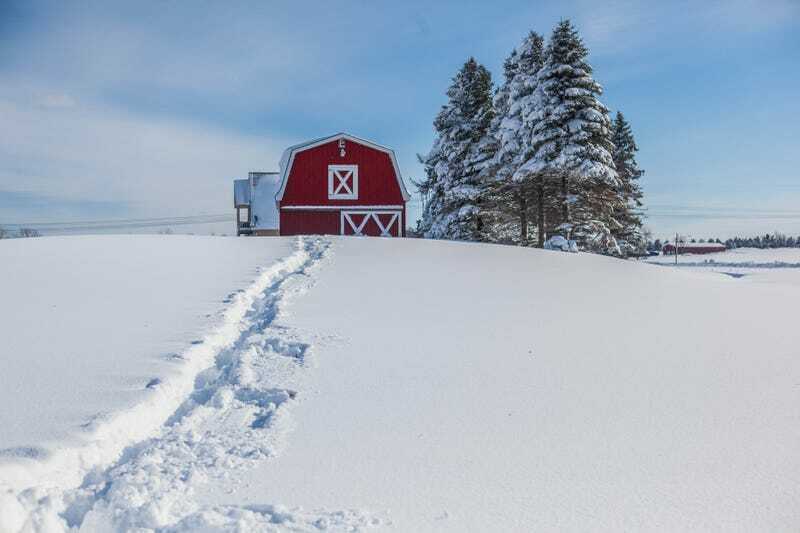 Red barn. Send your best photo by Monday, January 12th at 10 AM Eastern to contests@gizmodo.com with "Snow" in the subject line. Save your files as JPGs, and use a FirstnameLastnameSnow.jpg (970px wide) and FirstnameLastnameSnowWallpaper.jpg (2560px wide) naming conventions.